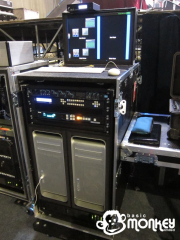 Basic Monkey has been asked to supply our new dual touring Catalyst system for Seal’s Summer European tour starting tomorrow. James will be accompanying the tour, looking after the system and interfacing with locally provided LED screens and projectors. The tour starts in Estonia, working back across Europe down towards Portugal with a few days in Russia in between, finishing at the end of July in Poland. Our new dual touring system is completely self contained, only requiring power and screen outputs to be connected. UPS, monitor, processing, multi-viewer, DAs and monitor are all within the rack to reduce truck space and enable swift load-ins. Keep checking back for updates over the next 5 weeks!